Compulsive skin picking cuticles has many reasons behind it as well as remedies to treat it. Compulsively picking the cuticles is medically known as Onychophagia. This syndrome not only involves picking the cuticles but also repetitively biting, chewing and picking the fingernails as well. Can Herbal Remedies Help With OCD? People suffering from compulsive skin picking may have an Obsessive Compulsive Disorder. Often they will continue picking or biting the skin around their fingernails until they bleed and often become infected. Some will even continue biting, chewing or picking the skin after it is damaged. There is often an underlying reason behind picking the cuticles. It can be associated with stress and extreme nervousness. When the person is overly stressed, picking the cuticles can have a soothing effect on the nervous system and reduce the level of stimulation that the person experiences. Boredom can also trigger the picking. Beside the cuticle picking, other skin picking involves scabs, acne, scalp and even the face. Once a person gets into the habit of cuticle picking, it is hard to break and they continue doing it no matter what the consequences. Another thing to do is keep your nails in great condition by getting a manicure. You may be discouraged to mess up your manicure by biting and picking your cuticles. Be sure to keep the skin around your nails groomed as well. Trim any hangnails and use a daily moisturizer to keep your cuticles hydrated. If the skin around your nails is healthy and manicured, you may be less likely to pick or bite it. 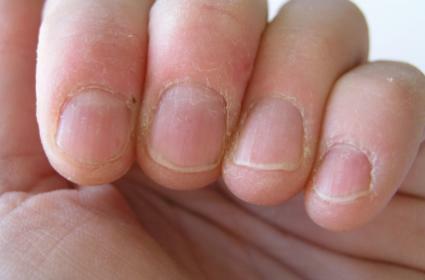 Compulsive picking often starts at hangnails or rough skin so preventing this will also prevent you from the behavior. Carry cuticle trimmers and a cuticle oil in your purse and if you feel the urge to pick, try trimming or applying the oil instead. If you happen to have an episode of extreme picking or biting, put bandages over your fingers to allow them to heal. Applying something that tastes bad will also prevent you from biting your cuticles or nails. Apply a moisturizer and try sleeping with soft gloves at night to discourage the behavior. If your cuticle picking reaches the point of pain and damage, it may have gone too far. It may be hard for you to break the habit yourself. Often the habit is due to deep emotions or internal conflict. It is best to seek medical attention. There are medicines available to help with OCD as well as certain therapies. Habit Reversal Training, a form of Cognitive Behavioral Therapy, has also been known to help with compulsive problems such as cuticle picking. The premise behind the therapy is that the picking is a response to specific situations and that the person may be unaware of the triggers. The training will help the person be more aware of the triggers and learn alternative behaviors to the situations. It is basically reversing the negative into a positive response..